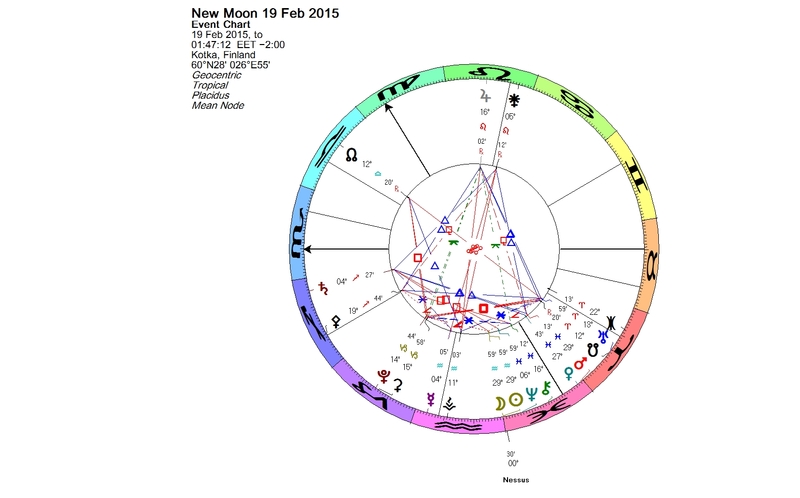 This was the second New Moon in Aquarius this year. January’s New Moon was in the first degree of Aquarius, and now, a month later, the New Moon was in the last degree of the same sign. The Moon and the Sun were in conjunction with 7066 Nessus, the third centaur, which is occupying the first degree of Pisces. The Moon and the Sun did not have much time to spend in Aquarius before shifting to Pisces. Nessus moves relatively slow. It has ingressed to Pisces earlier in the month, on Feb. 7, 2015. Nessus is a special centaur because of its naming process. Nessus was discovered in 1993 and given the preliminary designation 1993 HA2. Several astrologers in different countries had separately studied the object and had become to the conclusion that it should be named as Nessus. They approached astronomers with their name proposal. Usually the discoverer’s name suggestion gets approved by the International Astronomical Union. In 1997 the name Nessus was officially appointed by the IAU. For the first time in modern times, astrologers had a major role in the naming process of a celestial body. The orbital period of Nessus is 122 years. Nessus has to some extent a plutonic quality. The misuse of power is one of the themes, and the issues can be originating behind several generations. Dealing with a Nessus transit can be painful, but the transit also offers a chance for healing and release, as Nessus allows putting an end to those issues. “The buck stops here” is Melanie Reinhart’s keyword phrase for Nessus, and it refers to the sign which president Harry S.Truman held on his desk. Passing the buck is the act of attributing to another person one’s own responsibility. Melanie Reinhart is a centaur specialist and the author of Saturn, Chiron and the Centaurs, published in 1996. She trusted her research and used the name Nessus in the book, already before the official naming. The Aquarius New Moon fell half way between Pluto and Uranus, forming an aspect called a semi-square (45 degrees) to both planets, thus connecting this New Moon event with the Uranus-Pluto square, the long term aspect of our era. The semi-square resembles the square aspect. It is a challenging aspect, and this setting in the chart may temporarily highlight the negative side of Nessus. However, the interplay of Venus and Mars in conjunction in the late degrees of Pisces can offer some truly creative solutions in dealing with Nessus. This entry was posted on Saturday, February 21st, 2015 at 5:46 pm	and is filed under New Moon. You can follow any responses to this entry through the RSS 2.0 feed. You can leave a response, or trackback from your own site.